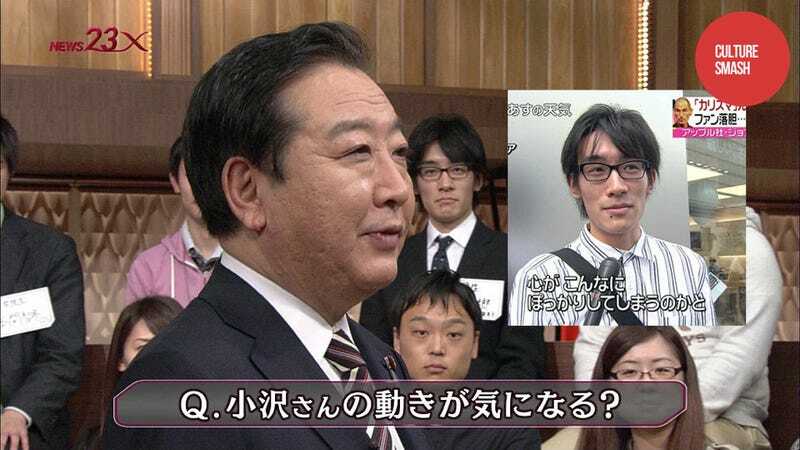 Last night on Japanese television, Prime Minister Noda appeared in a Q&A. To his side sat a young participant in black glasses. This young man's appearance, while certainly not striking, looked familiar to one Japanese net user, who quickly uploaded a photo showing the same man with a mic to his face. Impressed with the good catch, other net users quickly also noted that this man was not just some guy. He seemed to be a "sakura"—a plant or a phony. You know, a decoy. In the Noda clip, the man in glasses was essentially an extra, filling out the television frame. Noda, the Prime Minister, might have had no idea what was going on; he has far more pressing issues to worry about. However, some in Japan are questioning whether the broadcast was a "yarase", or "staged", program. When Steve Jobs passed away last fall, this same man in glasses was interviewed on the news. He was supposed to be a regular guy on the street, giving his opinion about Jobs' passing. In short, he was a sound bite that was supposed to sum up everyone's opinion. In another country, the same man appearing on television within the span of several months might be written off as a kwinky-dink. Not in Japan, where "sakura" are a well established practice. In the West, "sakura" is a famous Japanese word. It means "cherry blossoms" in English. But that sakura (桜) is not the same as this sakura (偽客), which has a very different meaning. While it's often written in hiragana or katakana (さくら or サクラ), sakura (偽客) literally means "fake" (偽) "customer" (客). The word dates back to the Meiji Era (1868-1912), and the concept is that retailers can inspire consumer desire by populating their stores with fake shoppers. It's a lure. So if you see a long line of customers waiting outside a restaurant, you probably think the restaurant is good. Japanese companies (and media) continue to use this ploy to this day. Don&apos;t Believe the Lines. Don&apos;t Believe the Hype. The meaning of "sakura" (偽客) has changed somewhat. It can now refer to people who appear on Japanese TV as ordinary people. Perhaps the TV crew couldn't get good interviews from regular people. Or perhaps it didn't even try. In those instances, a sakura will give the sound bite the network wants to push whatever angle the story needs. Some sakura are apparently members of theatrical companies. Others supposedly do it as a part-time gig. As far as I know, no sakura has made the leap from phony to mainstream celebrity. Online in Japan, people are quick to point out which interviewees are sakura and how many different times the same TV networks on a variety of topics have interviewed them. While the last cherry blossom petals are falling, on Japanese TV, sakura are always in bloom.